PAJU, South Korea North Korea on Wednesday barred South Korean workers from entering a jointly run factory park just over the heavily armed border in the North, officials in Seoul said, a day after Pyongyang announced it would restart its long-shuttered plutonium reactor and increase production of nuclear weapons material. The move to block South Koreans from going to their jobs at the Kaesong industrial complex, the last remaining symbol of detente between the rivals, comes amid increasing hostility from Pyongyang, which has threatened to stage nuclear and missile strikes on Seoul and Washington and has said that the armistice ending the 1950s Korean War is void. Seoul's Unification Ministry spokesman, Kim Hyung-suk, said Pyongyang was allowing South Koreans to return home from Kaesong. But Kim said about 480 South Koreans who had planned to travel to the park Wednesday had been refused entry. South Korean Defense Minister Kim Kwan-jin said Wednesday he was looking at all available options to ensure the safety of South Koreans who remain in the joint industrial zone, including military action in a worst-case scenario, according to South Korea's Yonhap news agency. Jeyup Kwaak, reporting for CBS News in Seoul, said the Ministry of Unification confirmed 33 South Koreans had returned from Kaesong by Wednesday evening. The ministry's deputy spokeswoman said 835, including seven non-South Korean foreigners remained at the complex. South Korea's Yonhap news agency quoted a worker who had returned, saying a lot of people chose to stay at the complex Wednesday evening because it was unclear whether North Korea would allow workers to enter on Thursday morning. North Korean authorities cited recent political circumstances on the Korean Peninsula when they delivered their decision to block South Korean workers from entering Kaesong, Kim said without elaborating. It's the latest sign of deepening tensions on the Korean Peninsula. North Korea said Tuesday that it will quickly begin "readjusting and restarting" the facilities at its main Yongbyon nuclear complex, including the plutonium reactor and a uranium enrichment plant. Both could produce fuel for nuclear weapons. Analysts saw the statement as Pyongyang's latest attempt to extract U.S. concessions by raising fears of war. Nuclear non-proliferation expert Mark Fitzpatrick, of the IISS, told CBSNews.com that Tuesday's warning from Pyongyang was merely "an announcement of an intention." "It would take them at least 6 months to get it going again," said Fitzpatrick. "The coming weeks will probably provide some evidence as to whether they're following through on it." "There's a long way to go between a stated intention and actually being able to pull it off," said State Department spokeswoman Victoria Nuland. Still, the U.S. is taking steps to ensure it has the capacity to defend itself and its allies against any threats from North Korea, and President Barack Obama is being updated regularly, said the president's spokesman, Jay Carney. "The entire national security team is focused on it," Carney said. The rising tide of threats in recent weeks is seen as an effort by the North to force new policies in Seoul and diplomatic talks with Washington, and to increase domestic loyalty to young North Korean leader Kim Jong Un by portraying him as a powerful military commander. China, one of the North's few major allies and vital trade partners, has been pressed by the U.S., Japan and South Korea to exert its influence and reign in the bellicose rhetoric and provocations by Pyongyang. China's Foreign Ministry confirmed Wednesday that Vice Foreign Minister Zhang Yesui had met separately on Tuesday afternoon with ambassadors from North and South Korea and the U.S. and expressed "serious concerns" over the situation. U.S. Defense Secretary Chuck Hagel called North Korea's development of nuclear weapons a growing threat. In a telephone call Tuesday evening to Chinese Defense Minister Chang Wanquan, Hagel said Washington and Beijing should continue to cooperate on North Korea's pursuit of nuclear weapons and ballistic missiles. So far, reports CBS News correspondent Margaret Brennan, North Korea has ignored all diplomatic efforts to diffuse the tension. The U.S. is planning a series of high-level meetings with Chinese officials to coordinate pressure on the North. North Korea is angry about ongoing South Korea-U.S. military drills and new U.N. sanctions over its Feb. 12 nuclear test, its third. The Korean Peninsula technically remains in a state of war because a truce, not a peace treaty, ended the Korean War. The United States stations 28,500 troops in South Korea as a deterrent to North Korea. The North's plutonium reactor began operations in 1986 but was shut down as part of international nuclear disarmament talks in 2007 that have since stalled. Tuesday's nuclear announcement underscores worries about North Korea's timetable for building a nuclear-tipped missile that could reach the United States, although Pyongyang is still believed to be years away from developing that technology. The North's rising rhetoric has been met by a display of U.S. military strength, including flights of nuclear-capable bombers and stealth jets at the annual South Korean-U.S. military drills that the allies call routine but that North Korea claims are invasion preparations. The Kaesong industrial park started producing goods in 2004 and has been an unusual point of cooperation in an otherwise hostile relationship between the Koreas. North and South Korea do not allow their citizens to travel to the other country without approval, but an exception had previously been made each day for the South Koreans working at Kaesong. About 120 South Korean firms run factories in the border town of Kaesong, with 53,000 North Koreans working there. Using North Korea's cheap, efficient labor, the Kaesong complex produced $470 million worth of goods last year. Pyongyang threatened last week to shut down the park, which is run with mostly North Korean labor and South Korean know-how. It expressed anger over South Korean media reports that said North Korea hadn't yet shut the park because it is a source of crucial hard currency for the impoverished country. In 2009, North Korea closed its border gate in anger over U.S.-South Korean military drills, leaving hundreds of South Korean workers stranded in Kaesong for several days. The park later resumed normal operations. "I feel worried that I'm unable to do business and also feel anxious," Joe In-suk, a 54-year-old South Korean who had planned to travel to Kaesong on Wednesday, said at a border checkpoint in Paju, South Korea. 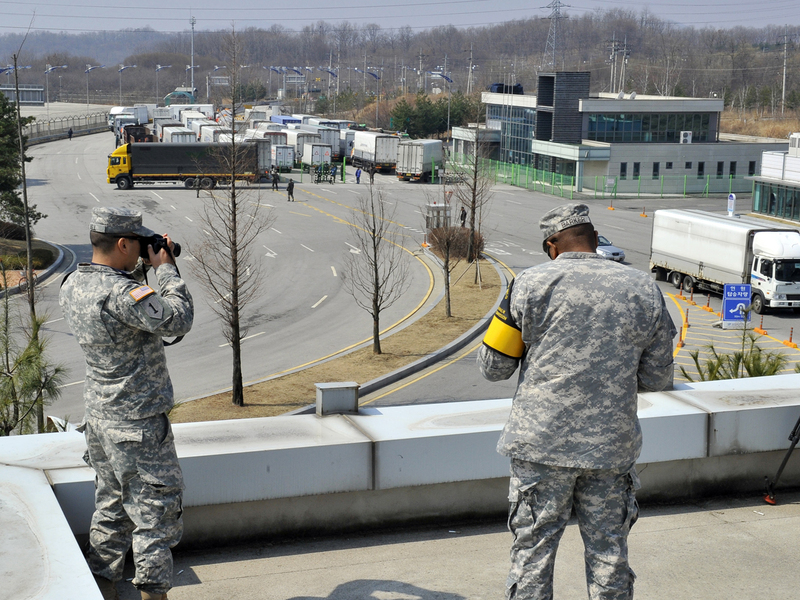 About a dozen South Korean trucks were lined up at the checkpoint leading into North Korea. If North Korea continues to deny entrance to South Korean workers, it could be tantamount to a shutdown because Kaesong factories cannot operate production lines without supplies of raw materials sent regularly by truck from the South to the North. A South Korean manager whose company runs a factory in Kaesong was worried that buyers would drop future orders if North Korea continued to block workers and supplies from the South. "For some companies, today's move must have already dealt them a blow," the manager said Wednesday, speaking on condition of anonymity because he wasn't authorized to talk to the media. "We cannot produce goods without raw material." Seoul's Unification Ministry urged Pyongyang to "immediately normalize" cross-border traffic in and out of Kaesong.